With his band getting increasingly formulaic, culminating with the quite adequate but somewhat disappointing One By One, Dave Grohl needed a break. Enter Probot, Grohl’s heavy metal side project whereupon he co-wrote and performed songs with metal icons like Lemmy, Max Cavalera, and King Diamond. With the self-titled Probot album out of his system, Grohl and his main band reconvened for In Your Honour, easily their most ambitious album to date, and arguably their best since The Colour And The Shape. The album is chock full of loud, anthemic rockers and contains a bevy of well-crafted soft rock compositions (a la “Walking After You”), the album’s sequencing and conception are seriously flawless. This is a 2-cd set, with the first cd containing 10 loud songs and the second showcasing 10 more slices of Grohl’s softer side. But all songs seem to blend into one another with several high profile cameo appearances from the likes of Norah Jones, Led Zepplin’s John Paul Jones, Kyuss/Queens Of The Stone Age’s Josh Homme, and The Wallflowers’ keyboardist Rami Jaffee. Fortunately, like I said before, almost all of these songs are good so the album is largely enjoyable anyway, even if I can’t help but think that a shorter set list that intermingled loud and soft songs was the way to go. That said, rather than focus on the albums flaws, let’s talk about its considerable strengths, shall we? 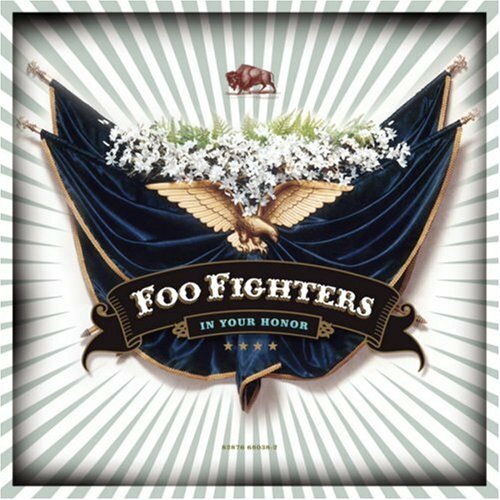 On disc 1, all the classic Foo Fighters elements are in place: Grohl and and Chris Shiflett’s guitars are crisp and loud, Hawkins and Mendel ably add heft to the bottom end, and Grohl’s alternately smooth and screaming rough vocals inevitably lead into the payoff: catchy chorus after catchy chorus. Although I marked down “In Your Honour,” No Way Back,” “Best Of You,” “DOA,” and “The Last Song” as highlights, almost every song here is a potential hit or highlight, even if the band lacks distinctive characteristics and the chance taking acumen to be truly exciting anymore. No, this disc is merely clean, highly professional arena rock (remember, Grohl has never worried about silly things like “indie credibility”) that doesn’t offer anything different but which rocks harder and with more consistent quality than any Foo Fighters album since the first two. As for the mellower second disc, it’s impressive and can never get boring. It’s largely due to the sequencing, as the songs are of a surprisingly high quality given that the band is usually much better at rocking out than on ballads. Personally, I prefer songs such as “Miracle,” “Over and Out,” and “On The Mend,” which are a little more instrumentally fleshed out, but there’s nary a truly duff track, and fans of Cobain (who “Friend Of A Friend” is about), Norah Jones (who sings the bossa nova flavored “Virginia Moon” with Grohl), and Taylor Hawkins (the band’s popular resident party animal who sings the livelier “Cold Day In The Sun”) should take particular note of those tracks. Some albums add up to more than the sum of their individual parts, some add up to less (which is why track-by-track album reviews don’t really work), and In Your Honor is the latter case, strong though many of its individual songs are. This entry was posted on Monday, April 11th, 2011 at 11:26 PM	and tagged with DaveGrohl, Foo Fighters, John Paul Jones, Josh Homme, Kurt Cobain, Led Zeppelin, Max Cavalera, Nirvana, Norah Jones, Rami Jaffee, Taylor Hawkins and posted in Foo Fighters, Music Albums Reviews. You can follow any responses to this entry through the RSS 2.0 feed.